Welcome to Day 17, if you are just arriving for the first time all the details and the linkup can be found HERE. 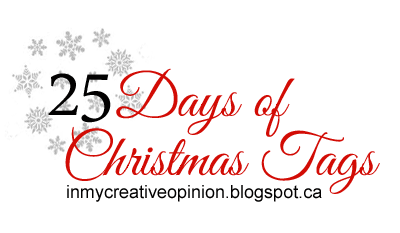 In honour of the 25 Days of Christmas Tags Event Birch Press is also offering a discount code! Enter code TRACEY for 20% off your entire order good from November 17 - 20! Sounds like a good reason to go shopping! 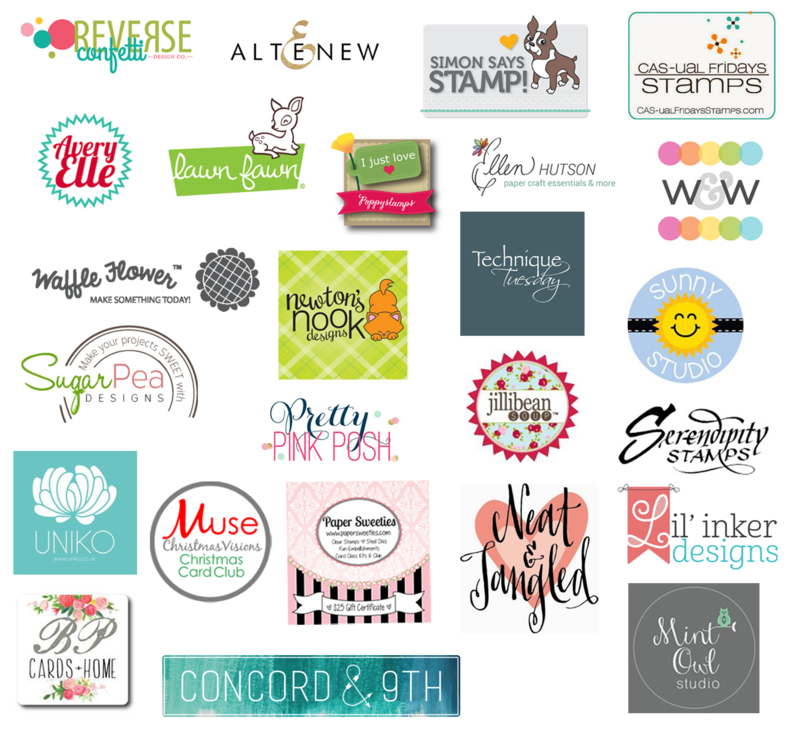 Don't forget there are so many ways for you to get multiple chances to win--by following the blog hop each day and commenting on the posts or by participating and making tags of your own. Just wanted to say I'm really enjoying this challenge, Tracey... It's the only thing I'm focusing on right now as I have my first craft stall try out on Dec 1st. These tags are all so gorgeous!! I wish I could CASE them all!! Ohhhhhhhh these are gorgeous! LOVING the trees on yours and Angela's tags!!!!!!!!!!!!!!!!!!! What inspired me today was the use of a simple die cut outline to create a tag. Simple but oh so pretty. Oh my goodness, such beautiful tags. 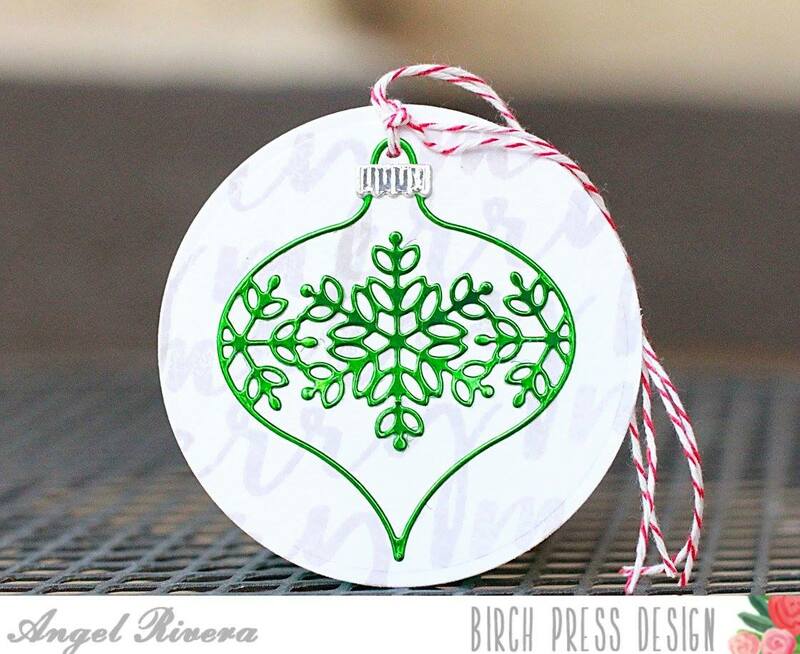 Today's inspiration: The ornament die tags and I have the Trio ornaments from Birch Press! Love these tags! So pretty! Loving your tags, tracey! That ornament die is really amazing! Wow! Stunning tags! Love the the trees/ornaments and Jeanne's colors on her tag! Love these beautiful dies. I really like how delicate the ornaments are and the tree is so lifelike. Beautiful tags, Tracey! 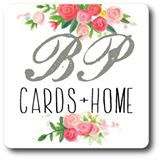 I love Birch Press Design--so elegant and classy and ALL the cards look amazing! Fabulous tags! Jeanne's color combo and layering on her tag inspired me today! Love the use of the silver. thanks for having this hop. Creative and inspirational tags! Love the ornaments! I'm so in love with BP layered dies, but don't know if I'll ever save up enough to get them--haha! Today's tags are lovely--especially Laurie's & your blue & silver one--stunning! All beautiful, but today I must say that Laurie's pink/white number has caught my eye, with its lovely little scalloped bottom! What a beautiful collection of tags. Love the ornament and the tree. Wow! All of these tags are so beautiful and festive! I especially like Angel and Tracey's snowy trees!! Pretty tags today. I like the snow covered trees on several of the tags today. I actually miss snow! We don't get as much as we used to here in NJ, and even though it presents problems for everyone with driving, etc. I still love the way it looks on the trees! Simply beautiful tags today from everyone - so inspired I'm off to finish the housework and get back to my desk to create my own. Thanks Tracey for hosting the challenge I'm really enjoying myself. I love all the glittery accents! Beautiful tags today! I love all the different ways the ornament was used! Beautiful! Love the variety of tags - each one is amazing! Thanks for sharing all this wonderful inspiration! Tracey, my favs so far. gorgeous tags. Want those ornament dies. Beautiful color combos! I like how traditional and elegant all of these are today! So many pretty tags; it's hard to pick one thing to be inspired by. I love how both Laurie & Tracey did their ribbons; tying a bow around the ribbon. I love that & will try that on some tags. Gorgeous and sweet tags....love that beautiful tree. Love all the beautiful tags. My inspiration today is the yellow background on the tag by Jeanne. wonderful tags - love the BP dies - fantastic inspiration from everyone! Totally inspired by the inlay work!! Those ornament dies make such pretty tags. Great ideas here. or do you send all your Tag sweety? Tracey, love all of your ornament tags. So beautiful. The tags are soooo pretty and elegant..love, love, love! Those ornament dies are absolutely gorgeous, Tracey. All the tags are especially elegant and sophisticated today. 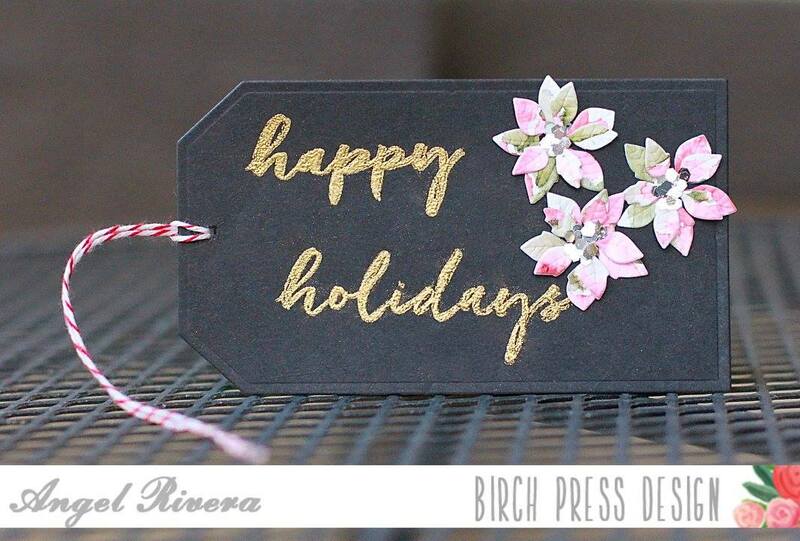 Love those Birch Press die cuts. Oh these are gorgeous! Tracey, I love the one of yours on kraft! 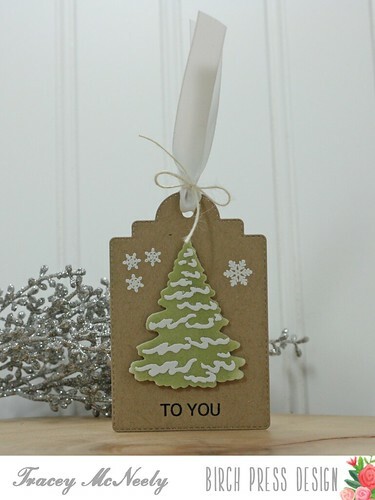 Tracey, you have blown me away with your tags today, those ornament die cut tags are simply gorgeous. All these tags are wonderful, thanks for posting them. 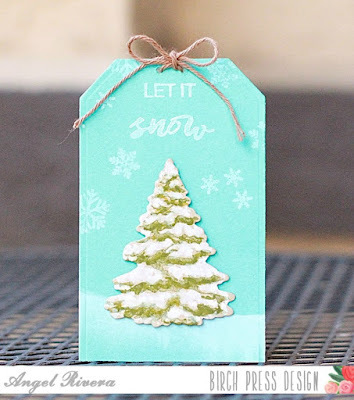 Awesome tags love the Christmas trees especially on the craft tag! They are all so pretty - hard to pick a favorite! Thanks for sharing so much inspiration! beautiful tags!! I simply love the snow on the tree in the last tag, it looks so real! 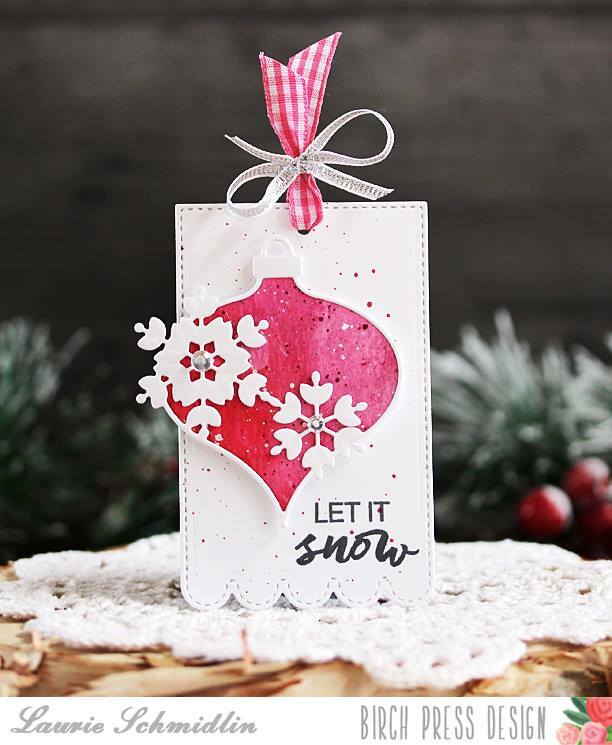 Laurie's ornament tag is so beautiful with the deep pink design and cute checked ribbon! Loved all the tags today. I love Birch Press. WOW... today's tags are gorgeous! Those ornament tags are my inspirations today! LOVE them! Oh wow!! I LOVE how you used the amazing ornament dies on your projects!! They are stunning!! Gorgeous tags, Tracey! I was most inspired by the way you used the positive and negative die cuts on your ornaments...so pretty! Unbelievable tags want this set all, just send them to me ok lol. Love the colours and dies used but the one that caught my eye the most was the first one with the yellow background and the white lattice, just beautiful. Love it. Wow yes awesome, lots of inspiration love the ornament though they are great, great. 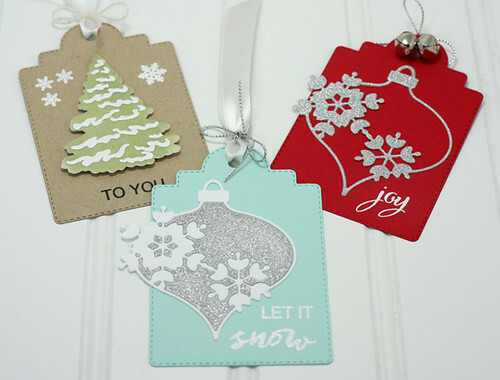 Love them all especially the ornament/snowflake tags! 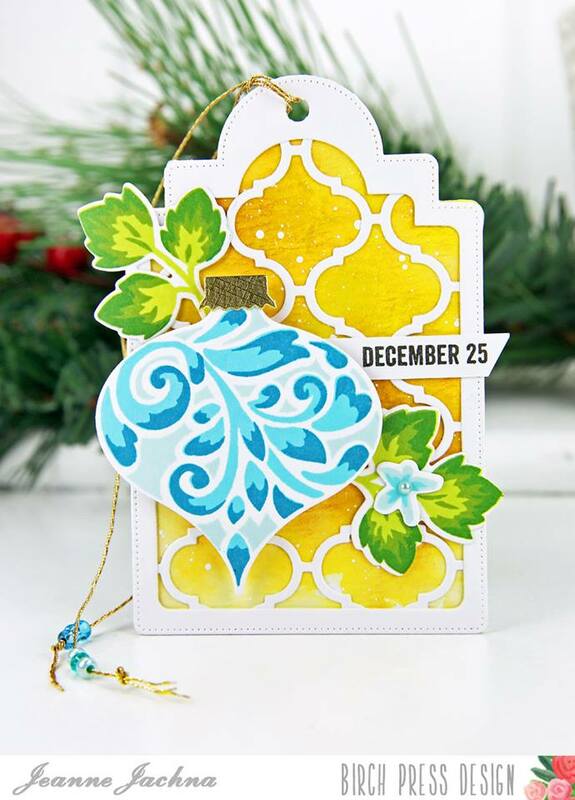 I am so drooling over that gorgeous yellow tag with the white trellis die cut... a stunner! Love the snowy tree on pale blue card. Simply lovely! All gorgeous, but I'm in love with your trio! I love this little tree with snow...I love kraft with soft colours. These die cuts are so pretty and elegant! The ornaments are gorgeous and love the little snowy tree! Great tags I really like the ornament with the snowflakes it it's so pretty. Love the first tags bold yellow background! 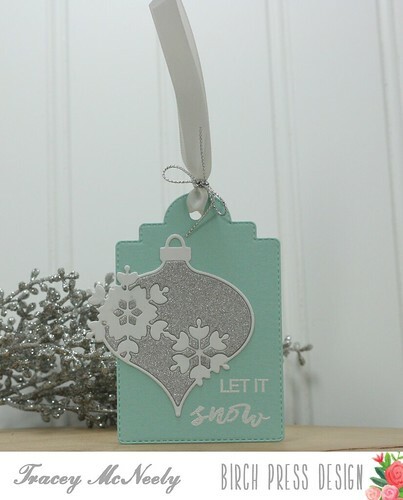 Beautiful die cut ornaments... amazing with or without sparkle!! Love, love!